Over Thanksgiving, my brother Jake and I worked on a jig saw puzzle. OMG, it was the hardest puzzle I have EVAAAR worked on. I suppose it would have been harder if we had done it upside down but just barely. I kept egging my brother on by saying, "Just keep helping, It will get alot easier real soon." Well, that was when we had about 100 pieces left. Then it was 50, 30, 20, 10, 5, ummmmmm still not easy. Honestly, when we had gotten down to the last 2 pieces we still didn't know which spot they went in without trying all the combinations to make them fit. Amazing. 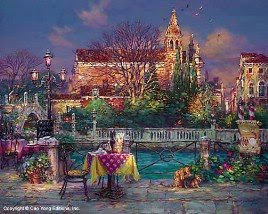 It was a 1000 piece puzzle of the painting "Pleasant Day" by Cao Yong. The colors in the puzzle seemed like they may have been a bit faded, because it seemed like all the peices looked alike. The only sections that were easy was the sky and he water. Ha,ha, you can thank Donna N. for this extremely HARD puzzle..I think I did about 20 pieces out of 1000...I won't say how long I worked on it.